Competition Way to Expand Malay Language Usage. THE Language and Literature will be organising more competitions for youths in its efforts to expand the use of the Malay language as the official language of the country as stated in Brunei Constitution of 1959. Speaking at the prize presentation ceremony for the Mekar-Juara Essay Contest 2008, Dr Mataim Bakar, director of Language and Literature Bureau said the competition was one of the activities carried out by the bureau in its effort to realise the country's aspiration to preserve language sovereignty and disseminate its use by encouraging youths to write articles in Malay. He said that youths are the main target of of the competition because hopefully they will continue to use the Malay language and proud of it. The contest, he added, is also to further enhance the youths proficiency in Malay so that it remains to be the language spoken at home and a "family" language. In doing so, he added, Bruneian will still feel they are living in this country and not in the West. Apart from promoting the use of Malay language, the essay contest helped the studentsto know their potentials and abilities in writing. "It is not easy to produce a good essay. Well written essay need to have its strengths from various aspects which include critical thinking relevant to the topics proposed, systematic thoughts, good usage of vocabulary and grammars, and providing relevant and concrete examples for the essay topic," the director said. Reading and being insightful of the reading materials, he added, were also very crucial in order to formulate a good writing. "Students should be diligent, active and positively aggressive in order to gain more experience, because it would be easier to write an issue based on experience thus making the story stronger and interesting," he stated.He also pointed out that the use of good vocabulary and grammar as well as with the addition of creativity and writing styles in any compositions would definitely attract the readers," he said. The director noted that reading culture in Brunei is not seriously taken into consideration. "Even with the lowest price offered for the Mekar and Juara Pelajar magazines, we find it difficult to sell off the 3,000 copies. 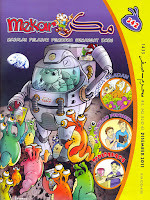 This shows how these local magazines do not receive encouraging and positive response from the students," he said. 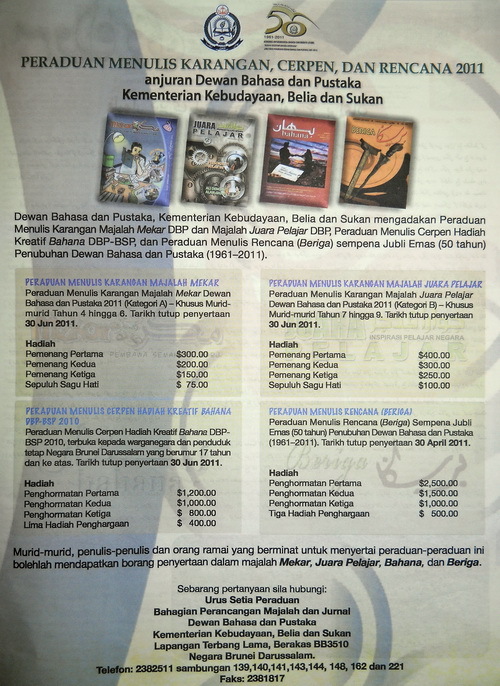 The Mekar-Juara Essay Contest is an annual project organised by the bureau design to promote the Mekar and Juara Pelajar magazines as reading materials for primary and lower secondary students in the country. It also aimed at making students accustomed to expound their ideas objectively and appropriately through writing, apart from boosting their proficiency in the language and enhancing their interests in writing and reading. Winners of Writing Contest Rewarded. Literature buffs attend meet in Labuan. Penulis Bukan Islam Tidak Fahami Agama. 'Writers shape values and morals of a society'.